Members of the Step Team seen kneeling during the national anthem. The kneeling of NFL players during the national anthem has sparked controversy across the country and this act of protest has spread beyond the National Football League. This once localized form of protest has spread from NFL teams, to other major sports, with regular Americans joining the cause. During this time the act of kneeling during the anthem has caught the attention of President Trump and other vocal opponents. Several members of NFL teams have stayed in the locker rooms, linked arms, or raised their fist to show protest. The protest began last year with quarterback Colin Kaepernick remaining seated during the anthem, after meeting with Nate Boyer, a former Army Green Beret and NFL long-snapper with the Seattle Seahawks, Kaepernick adjusted the protest to a kneel to maintain respect during the protest of racial injustice in the United States. “I am not going to show pride in a flag that oppresses black people and people of color,” Colin Kaepernick said last year following questioning as to why he didn’t rise for the national anthem. Kaepernick states he was not attempting to disregard members of the military through his act. A year later, his former team the 49ers knelt during the anthem and this action was inspired by Kaepernick as they continue to fight for racial equality. The First Amendment ensures the freedom of speech, assembly, religion, and petition. According to the U.S Constitution, people who do not rise for the “Star Spangled Banner” cannot be legally reprimanded as the First Amendment gives them the freedom to protest peacefully. 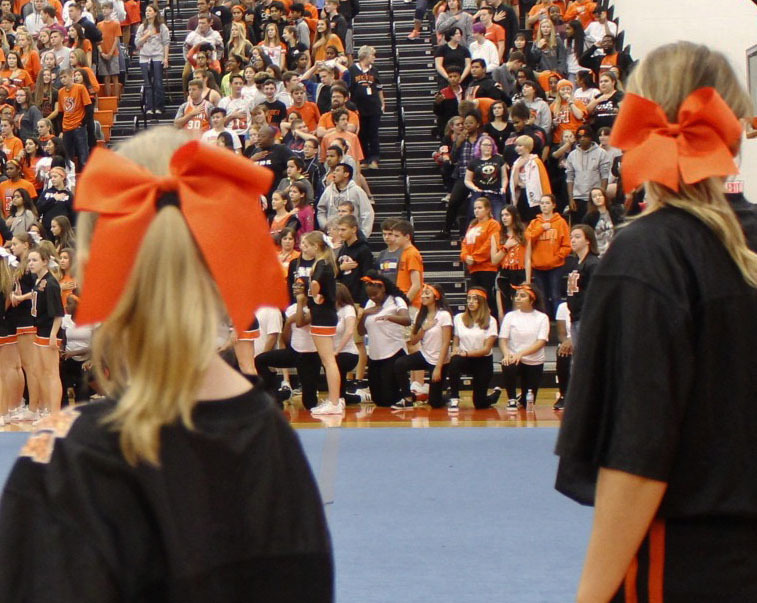 A similar tradition to the national anthem at sporting events is the “Pledge of Allegiance” at Normal Community High School, which is recited following the announcements every Monday. Some students have taken to remaining seated during the weekly pledge. “Not standing for the “Pledge of Allegiance”, or national anthem, isn’t a sign of disrespect,” Brie Halperin (11) said ,”because you are just kneeling. It’s a sign of hope that one day we can, as a county, uphold the values that we have in the pledge of allegiance.” It is the “liberty and justice for all” aspects of the Pledge of the Allegiance that students who remain seated during the pledge are attempting to draw attention to. Kneeling for national anthem or sitting during the Pledge of Allegiance are acts that are spreading, not just current events conversations for the classroom. Acts of protest like these are occurring at NCHS. 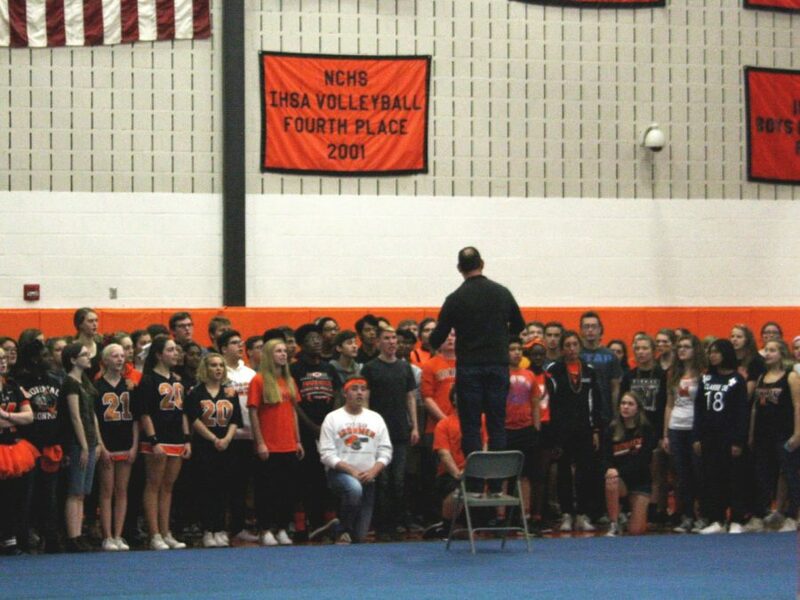 Students in the gymnasium opted to not rise for the anthem during the Homecoming assembly on October 13. Choir singers, members of the Social Studies Club, members of the Step Team, and students in the bleachers did not stand during the choir’s singing of the national anthem. “As a group we’re passionate about fighting for the rights of individuals. And this year alone we have seen a significant amount of racial injustice,” Sara Nur-Awaleh, Normal Community High School senior and Social Studies Club member, told WGLT reporters. Not all sides see the protest as respectful, from President Trump to everyday high school students, some do not support kneeling during the national anthem. On the national level, NFL football players and at the local level, high school students stay seated for the national anthem as a form of protest against the injustice and mistreatment of people of color in the United States. This demonstration is growing. So is the resistance against it. Houston Texans players are planning to protest as a unit before Sunday’s game against the Seattle Seahawks in the wake of the comment, a league source told ESPN’s Adam Schefter. According to the most recent data from the Institute for Diversity and Ethics in Sports, NFL rosters are predominantly African-American, 69.7% in 2016, while NFL ownership and league office personal are predominantly white (73.1% in 2016). NFL team administrations are similar with no people of color filling the highest team office role of team president in 2017, and 75% of head coaches being white. This, after the Rooney Rule in 2003, where the NFL adopted a policy requiring teams to interview minority candidates for head coaching and senior football operation jobs. Mcnair’s equation of the NFL players to inmates echoes the institutional racism that Kaepernick was demonstrating against. It is speculated that Kaepernick’s social activism is the reason that the 29-year-old is out of the league. Free agent quarterback Colin Kaepernick is pursuing a collusion grievance against the NFL under the CBA, according to Jason La Canfora of CBS Sports and Mike Freeman of Bleacher Report.